Rep. Brian Patrick Kennedy, D-Hopkinton, said it was “a big concern” that the bill (H5813) could remove land from property tax rolls and increase residential tax bills. The primary advocate for the bill, Lawrence Taft, executive director of the Audubon Society of Rhode Island, said the legislation preserves and manages Rhode Island’s “fragmenting” open space and offers protection against climate change, which threatens to destroy or displace 50 percent of bird species. Taft noted that woodlands deserve the same protections that wetlands first received in the 1960s. Without hearing testimony from the sponsor or other witnesses, Rep. Sherry Roberts, R-West Greenwich, said she would vote against the bill because it gives additional power to the Rhode Island Department of Environmental Management (DEM). Private landowners, she said, are doing a better job than the state. “I believe (private landowners) can make their own decisions and they are doing a wonderful job at that,” Roberts said. If approved, the Woodland Preservation and Stewardship Act would make it state policy to preserve and manage woodlands and urban treescapes much is it does for farmland, wetlands, and floodplains. A forest management program would be drafted by an advisory commission by April 24, 2020 and eventually adopted by cities and towns. Many skeptics don’t like that DEM would oversee compliance and enforcement. Rep. Bernard Hawkins, D-Smithfield, worried that DEM would be buying land though bond referendums and taking it off tax rolls. He also criticized the Audubon Society and land trusts for protecting land around the Scituate Reservoir, the drinking-water supply for 60 percent of Rhode Islanders, because it removed property from the local tax base. 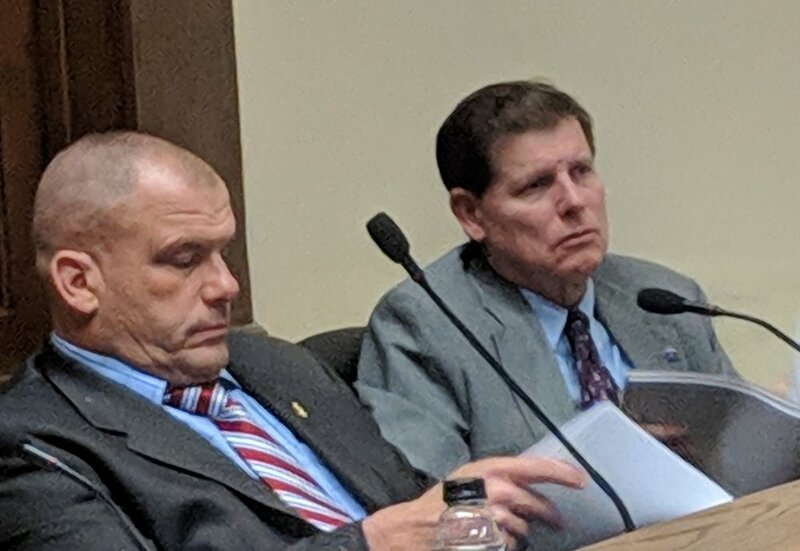 The sponsor of the bill, Rep. Art Handy, D-Cranston, noted that new homes often receive more in municipal services than their occupants pay in property taxes and that private forested areas typically pay lower taxes than residential and commercial development. “Something is better than nothing, because once you take it off the tax rolls it’s gone,” Hawkins replied. Rep. Bernard Hawkins, D-Smithfield, left, and Rep. Brian Patrick Kennedy, D-Hopkinton, claim the program would shrink the tax base. Grow Smart Rhode Island supports the intent of the bill because it protects land threatened by ground-mounted solar sprawl. But the smart growth advocacy group and others are concerned that the program may conflict with a forthcoming forest management report from the Rhode Island Forest Conservation Council, a project overseen by the Rhode Island Tree Council. The Rhode Island Farm Bureau likes that the legislation offers technical help and stewardship for woodland lots less than 10 acres in size. Ralph Pratt of the Greene Company, which owns a 250-acre parcel with a small cranberry bog and a 1,000-plus-acre woodland area in Coventry, said the program would make it harder for his forestry operations to run. Instead, Pratt wanted the state to make forests economically viable for recreation, wood products, and natural habitat. “We’re forgetting the ability of the private landowner to mange the forest and keep it healthy,” Pratt said. Logger Jeffery Henderson of JP Wood Service in Exeter said private landowners have been effectively managing woodland properly for decades. Henderson didn’t like that the state would have legal oversight. “The state is not going to do anything for us, all they are going to do is harm us,” he said. The Environmental Council of Rhode Island supports the bill because it slows the loss of open space and woodlands to utility-scale solar arrays. It also protects land, like the 67 acres of forestland sited for the proposed Burrillville power plant. The Burrillville Land Trust, the Conservation Law Foundation, and Save The Bay also support the bill. The Nature Conservancy Rhode Island said the bill helps in the decades-long effort to protect the coastal woodland corridor the runs between Washington, D.C., and Rhode island. Holding a satellite photo of the Northeast region at night, Sheila Dormody explained that the forest corridor protects habitat from threats such as climate change. “And of course, these are the lungs for our state. They are also important for our health and for our mental health, as well,” said Dormody, government relations and cities program manager for The Nature Conservancy. She added that the bill treats all threats to open space the same, not just the siting of solar facilities. The bill was held for further study to allow for changes to the legislation.